We are the number one social networking site for women. A place where women of all ages and backgrounds can come to talk, share and bond with new female friends. 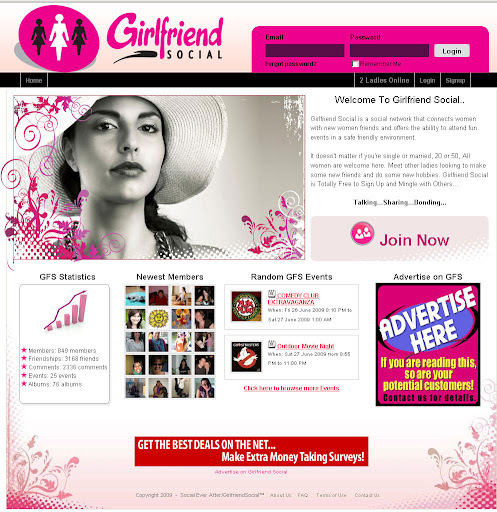 Girlfriend Social is one of the biggest female-only social networking sites available. Established in Jan, 2009, GFS is still expanding. With currently over 250k of members, it’s working. Free for all women to sign up, GFS website allows them to talk, share and bond in whatever ways they are comfortable. Events are posted by a local rep, local companies and verified members. The discussion areas inside allow women to chat on topics ranging from the best local hair salons to how best to get over a break up or how to deal with fleas on your pet. Chat rooms, Messaging features, and ability to review companies is all inside! Girlfriend Social, based in Toronto, Ontario, Canada, is currently available for women in Major cities in North America, UK and Australia.